The Daily Star (Lebanon) published an interesting compilation, here, on the reports of the cause of Rustom Ghazali’s death, announced this morning. The Daily Star noted that “reports conflicted over his cause of death, and when and where he died. The news comes nearly two months after he was reported to have been badly beaten by Syrian security forces”. In 2002, Ghazali became head of Syrian Military Intelligence, replacing General Ghazi Kanaan [who is said to have committed suicide, an explanation at odds with the circumstances, including the number of shots to his head]. As The Daily Star put it, “Ghazaleh succeeded Ghazi Kanaan as head of military intelligence in Lebanon in 2002 during Syria’s tutelage over Lebanon, which lasted until Damascus pulled its troops from the country in 2005. It is widely speculated that he was one of the men who orchestrated the assassination of Lebanese Prime Minister Rafik Hariri. Damascus denies any involvement in the 2005 killing”. In 2012, The Daily Star wrote today, “Ghazaleh was appointed the chief of Syria’s infamous political security branch”. According to an AFP report cited by The Daily Star, a “family source” said that Ghazaleh “had been fired after getting into a fight with another Syrian official in early March”. A UN Security Council-mandated team of Chemical Weapons [CW] inspectors has been back on the ground in Syria for a second time, investigating several more reported CW attacks [including three that reported occurred after the large August 21 attack in Ghouta]. The BBC has produced a graphic to show the sites of the second investigations. The BBC also reported here, that the UN CW team, “led by Ake Sellstrom, arrived in Syria for its second visit on 25 September and hopes to finish its work by Monday 30 September”. The UN CW team completed a six-day mission on 1 October, the UN reported here. They are reportedly aiming at producing a “comprehensive” report by the end of October. 1st, Khan al-Assal on 19 March 2013, was requested months ago by Syria. The UNSG promised to investigate before August 21 [in fact, that’s why the UN CW team was in Syria when the 21 August attack took place]. After the August 21 CW attacks on Ghouta, Syria’s Ambassador Bashar al-Assad demanded UN inspection of 3 post-August 21 attacks near Damascus [rebel accidents handling CW/precursors in tunnels etc] on 22, 24 and 25 August This can be see on Youtube here — though Ambassador Jaafari seemed to give a different order of dates and places from those shown in the graphic above, supposedly based on UN information. Syria’s Amb al-Jaafari also complained [in May] about the April 29th attack in Saraqeb; it was also cited by a defector as well as in French + UK declassified reports released at the end of August. “The joint OPCW-UN team mandated to assist Syria with the elimination of its chemical weapons programme has made encouraging initial progress, following the first working day of meetings with the Syrian authorities. Documents handed over yesterday by the Syrian Government look promising, according to team members, but further analysis, particularly of technical diagrams, will be necessary and some more questions remain to be answered. The team hopes to begin onsite inspections and the initial disabling of equipment within the next week, but this depends on the outcome of the technical groups established with the participation of Syrian experts yesterday. These groups are working on three areas which are key to the mission’s success: verification of the information handed over by the Syrian Government; the safety and security of the inspection teams; and practical arrangements for implementing the plan, under which Syria’s chemical weapons material and equipment are to be eliminated by mid-2014″. This OPCW press release is posted on the UN News website here. 22 August 2013: UNSG BAN Ki-Moon has sent a team of CW inspectors back to investigate three reported CW attacks after the large 21 August attack on Ghouta. All three were in the Damascus area: the first was in Bahhariya on 22 August [no further details yet available, though this was apparently one of the attacks mentioned by Syria’s Ambassador to the UN Bashar al-Jaafari, attacks he blamed on “terrorists” = rebels], and the other two were on 24 August in Jobar and on 25 August in Ashrafiya Sahnaya. 24 August 2013: Syrian State TV reports on discovery [from RT] of what the reporter says were rebel preparations to make CW in tunnels in Jobar area of Damascus’ Ghouta-area suburbs. Also reported by Reuters here, which noted that The UN’s High Representative for Disarmament Affairs Angela Kane arrived in Damascus the same day, “to push for access to the suspected chemical weapons attack site for UN inspectors”. 25 August 2013: Ashrafiya Sahnaya [no further details yet available; a second UN CW team is currently investigating the report on the ground. This was apparently one of the attacks mentioned by Syria’s Ambassador to the UN Bashar al-Jaafari, attacks he blamed on “terrorists” [rebels]. 28 August 2013: Syria’s Ambassador to the United Nations in New York, Bashar al-Jaafari, made a statement to journalists [and anyone else listening] at a UN TV “stakeout” outside the UN Security Council. Jaafari said that he had just addressed a letter asking the UN Secretary-General to mandate immediately the UN team now in Damascus to investigate 3 “heinous” [post-Ghouta] #CW attacks — on 22, 24 + 25 Aug in Jobar, Sahnaya + Bahariya, affecting Syrian troops [dozens of Syrian soldiers were currently being treated in Syrian hospital, he said]. “Members of Syrian Army inhaled poisonous gas … close to what we call Sarin”, he said, as a result of use of chemical agents by “the terrorist armed groups operating in the countryside of Damascus”. Jaafari: “This makes 420 letters we’ve addressed to the UNSG + UNSC since the beginning of the crisis this year” about all details related to all developments pertaining to the Syrian crisis. 1) Did #CW attack take place or not? Syrian’s Ambassador to UN said that the UN, and therefore the UN #CW investigation team, already has some evidence of rebel/opposition use of #CW. This evidence, he said, includes a Turkish report that 12 members, “terrorist members”, Jabhat al- Nasra people were arrested in Turkey with 2 liters [he said “liters”] of Sarin. He said that according to the Turkish report, the Jabhat Nasra people took the 2 liters of Sarin with them on board a civilian airliner from Libya to Turkey. The Jabhat Nusra people confessed after capture in Turkey, he said, that they “intended to use it in #Syria”. 28 August 2013: The UK Prime Minister ?Tweets: @Number10gov – UK to put fwrd resolution authorising all necessary measures under Ch7 of UN Charter to protect civilians from #chemicalweapons in #Syria [It does not get unanimous support, as Russa + China oppose mention of Chapter 7. 30 August 2013: US declassified brief = Government Assessment of the Syrian Government’s Use of Chemical Weapons on August 21, 2013: “The United States Government assesses with high confidence that the Syrian government carried out a chemical weapons attack in the Damascus suburbs on August 21, 2013. We further assess that the regime used a nerve agent in the attack… To protect sources and methods, we cannot publicly release all available intelligence”. 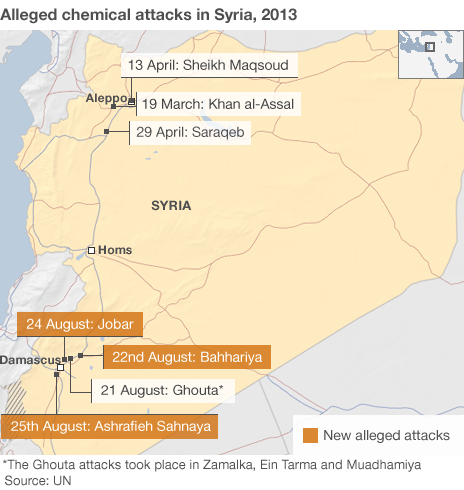 21 August 2013: evidence emerged from Syria of pre-dawn attacks including use of chemical weapons on the Ghouta area in the Damascus suburbs contested by rebel forces and Syrian army units. This attack differs from all previous CW attacks in Syria because of the large number of victims: over 1500 are believed to have died. Human Rights Watch [HRW] wrote, in their report issued on 10 September 2013: “As more details became available, it became clear that the attack had affected two separate opposition-controlled districts in Damascus Suburbs governorate, located 16 kilometers apart. According to local residents, the Zamalka neighborhood in Eastern Ghouta was struck by rockets at some time between 2 and 3 a.m., and the Moadamiya neighborhood in Western Ghouta was struck by rockets at about 5 a.m., shortly after the completion of the Muslim morning prayer”. “Sarin is a toxic but non-persistent nerve agent. Exposure is usually due to inhalation, and the agent rather quickly degrades and disperses into atmosphere… There are reports that people were able to visit the sites of the attacks a few hours post attack and to handle remnants of rockets associated with the attacks without suffering signs and symptoms of exposure to nerve agent. This suggests that the nerve agent involved is more likely to be the less persistent and less toxic agent, Sarin, rather than VX… The large number of victims of the attack, the clinical signs and symptoms that characterized both the victims and, later, the medical workers who treated the victims, and the fact that areas near attack sites were apparently safe to enter soon after the attack, all strongly suggest that the attack involved an organophosphate chemical more toxic that the pesticide Malathion, and was most likely a toxic but non-persistent chemical warfare nerve agent, such as Sarin, which Syria is believed to possess. The HRW report says “The precise identification of the specific chemical agent used in the August 21 attack requires the collection of samples from weapon remnants, environmental samples, and physiological samples from those directly or indirectly exposed to the chemical agent. Subsequent specialized analyses of these samples can reveal the specific agent itself or the reaction or degradation products characteristic of a specific agent. The UN investigative team has collected such samples, and will issue its findings after the completion of its investigation… This is posted here. A witness in Moadamiya media center told HRW that “all of the rockets were of the same type” [identified by Human Rights Watch as a Soviet- produced 140mm rocket], and said he counted 7 rockets which fell in two areas of Moadamiya. HRW says “the attack on Moadamiya on August 21 represents the first known appearance of the 140mm rocket, which has not [previously] been documented in use in the current Syrian conflict”. “The 140mm rocket is documented in standard reference materials as being present in the Syrian government’s weapons arsenal. Designed in the 1950s, the Soviet Union transferred 200 BM-14 launchers, the most common launcher for 140mm rockets made by the Soviet Union, to Syria in 1967-1969… according to the database on arms transfers maintained by the Stockholm International Peace Research Institute (SIPRI). • A chemical warhead containing 2.2 kilograms of Sarin. “Based on witness statements describing the impact of the rockets and the absence of rocket remnants or reported types of injuries consistent with an attack using high explosive or incendiary payloads, Human Rights Watch believes there is little possibility that the rocket could have been carrying high explosive or incendiary payloads. Given the large number of casualties, this leaves a chemical agent warhead as a strong remaining possibility, which would be consistent with the symptoms displayed by the victims. “Measurements determine that the estimated volume of nerve agent inside the warheads would be approximately 50 to 60 liters, compared to 2.2 liters for the warheads designed for the 140mm rockets. “[The] dimensions are compatible with the Iranian-produced 333mm Falaq-2 launcher, or close copies and derivatives thereof. Iran is believed to be the only country in the world to produce rocket launchers in the 333mm category. Videos have appeared showing Syrian forces using the Falaq-2 launching system to launch what appears to be versions of the 330mm rockets, although the launches seen in the video occurred during daytime and are thus unrelated to the August 21 nighttime attack. “The non-aerodynamic design of the rocket indicates that the rocket would be relatively short-ranged and not capable of accurate targeting. The consistency in the design of these rockets suggests that they were locally but industrially produced, and apparently designed to be deployed with the Iranian 333mm launchers or derivatives thereof. Source: “Attacks on Ghouta: Analysis of Alleged Use of Chemical Weapons in Syria”, Human Rights Watch, 10 September 2013. Posted here. 21 August 2013: Alternate theory [Tom Wyld]: “Based on my past analyses of the fighting in East Ghouta and appraisals of their involvement in Syrian command and control, I assess as highly likely that Hezbollah and Sepah Pasdaran (Iran’s Islamic Revolutionary Guard Corps) were involved in the attack. If reports are accurate, this is an extraordinary military and geo-political development with grave international consequences”. This is posted here. This photo was posted on Twitter here by @NMSyria. Despite the proximity to the border, the only reported Turkish response was to take in the wounded for medical treatment. Some of the seriously wounded later died in Turkey, compounding confusion about numbers of mortalities. Voice of America [VOA] reporter Scott Bobb, in the town yesterday for an interview with “a local rebel commander”, was present and apparently taken by surprise at the time of the attack. He reported that “Azaz [Ezzaz] has been in rebel control for weeks and was not a government target until Wednesday…’This town had been held by the FSA for some time. It was fairly stable and many of the refugees had returned. Locals say it was the first bombing they have experienced”… His report is posted here. UPDATE: Human Rights Watch [HRW] has compiled a report during a visit two hours after the attacks by a Syrian fighter jet on Wednesday, and is now saying that 40 people were killed, and more than 100 were wounded. HRW said that: “at least two bombs destroyed an entire block of houses in the al-Hara al-Kablie neighborhood of Azaz, in Syria’s northern Aleppo province … Azaz residents told Human Rights Watch that, at around 3 p.m., they saw a fighter jet drop at least two bombs on the residential area. Within seconds, dozens of houses in an area of approximately 70-by-70 meters – more than half a football field – were flattened. Houses on the surrounding streets were significantly damaged, with collapsed walls and ceilings. On the streets around the bombed area, windows were broken and some walls had collapsed. Two opposition Free Syrian Army facilities in the vicinity of the attack might have been targets of the Syrian aircraft, Human Rights Watch said. One was the headquarters of the local Free Syrian Army brigade, in the former building of the Baath party, two streets away from the block that was hit. The other was a detention facility where the Free Syrian Army held ‘security detainees’ – government military personnel and members of pro-government shabeeha militia. Neither of these facilities was damaged in the attack … The exact number of victims is difficult to verify. Most of the wounded were transported to hospitals across the nearby Turkish border”. This report is posted here. Other reports, on Twitter, claimed that one or more “vacuum” bombs had been dropped in the government aerial attack on Azaz on Wednesday. In the aftermath, Syria’s membership in the Organization of the Islamic Conference [OIC] was suspended overnight, as it had been months earlier in the Arab League. And, a two-person committee appointed by the UN Human Rights Council in Geneva issued its latest report, on developments from 15 February to 20 July. This latest report is the first since the International Committee of the Red Cross [ICRC] made a determination [it is apparently up to the ICRC to do this] that the conflict in Syria had reached the level of civil war. The UN HRC-appointed committee is composed of human rights expert Paulo Pinheiro of Brazil and Karen Abu Zayd of the U.S., has not been permitted to enter Syria, and is working from compiled reports and visits to neighboring countries in the region, as well as by interviews conducted over the phone and by Skype. Their latest report said there are “reasonable grounds to believe” that the documented instances reported to them show “widespread or systematic attack against predominantly civilian population”. And, the UN HRC report said, the commission concluded that the scale of the attacks on a predominantly civilian population showed they were “conducted pursuant to State policy”. What does it look like when a state kills its own citizens [people the state is meant to protect]? These photos are part of a photo gallery of Goran Tomasevic’s photos for Reuters, over a 12-day period in Syria, published by The Telegraph, here. This photo + its caption is published on the White House website, here. The Turkish English-language paper, Hurriyet Daily News, wrote Friday here that White House National Security Council spokeswoman Caitlin Hayden said the White House “had been keeping a close watch on the debate in Turkey that followed the release of the photo”. Five months ago, former UN Secretary-General Annan [who is retired, after two terms in office and living in Geneva] accepted the job of joint UN and Arab League envoy to end to bloodshed in Syria. Today, Annan told journalists at a news conference in the Palais des Nations in Geneva that he was giving up — but he’s apparently not walking out and leaving right away, he said…. He’ll be leaving at the end of the month, on 31 August. Coincidentally, France — which is the most gung-ho in wanting intervention in Syria — has assumed the rotating presidency of the UN Security Council for the month, and will preside over all deliberations durin the entire of August. Does that suggest that Annan might be persuaded, if circumstances change, to change his mind? It seems not. Here is what he replied when asked by a journalist, “Is this a resignation?”: “Yes, I am not going to continue”, Annan said. But, there’s something about this that gives the impression that Annan didn’t jump on his own, and that he was pushed. Just look at the expressions on these two faces — both of these men, including spokesperson Ahmad Fawzi on the left, show unease, if not chagrin — not regret or firm determination. They look perturbed. This photo is posted by the UN here. 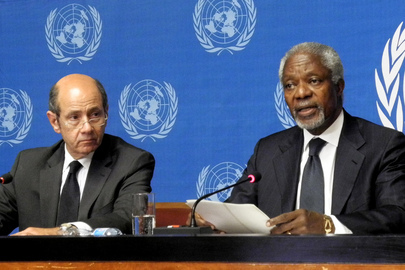 Ian Black wrote in The Guardian here that Annan made “a sometimes bitter and frustrated statement” in the Geneva press conference. Black also wrote that “Sluggish and ineffective diplomacy has been outpaced by a fast-moving and increasingly dangerous situation” on the ground in Syria, particularly in Aleppo. It may be that Annan was perturbed by a reference, reportedly since eliminated, that he should better focus his efforts — a reference contained in a Saudi-backed draft text on Syria due to be presented to the UN General Assembly on Friday. Former UNSG Kofi Annan, who is now the joint envoy of the UN and the Arab League with a mandate to end the violence in Syria, is readying a recommendation that will be delivered to the UN Security Council in New York later today to establish a 250-observer force that will also have its own helicopter support. The Syrian Government was involved in Annan’s planning discussions, and apparently agrees with this proposal. It has already been presented to the Arab League, before it goes to the UNSC today. Reuters is reporting that “A six-day-old truce has held in some parts of Syria since President Bashar al-Assad pledged to enforce it last week. But in strong opposition areas such as Homs, Hama, Idlib and Deraa the army continues to attack and battle rebels, using heavy weapons in violation of the pledge by Damascus to pull back. After negotiations led by former U.N. Secretary General Kofi Annan acting as envoy of the United Nations and Arab League, Assad’s government has agreed to allow a small U.N. force to monitor the ceasefire. But the planned 250-strong mission is a fraction of the size of U.N. peacekeeping forces sent to other conflicts, raising doubt among Assad’s opponents about whether it can be effective or will serve as a figleaf substitute for more robust action”. This is reported here . UPDATE: Later, the number went up from 250 to 300 observers, Reuters reported on Thursday 19 April: “In a letter to the Security Council on Wednesday, [UNSG] Ban said Syria had not fully complied with Annan’s six-point peace plan but still outlined plans to deploy up to 300 observers for three months to supervise a fragile truce between forces loyal to President Bashar al-Assad and opposition fighters seeking to oust him. Ban said the observers would be deployed incrementally over a period of weeks, in approximately ten locations throughout Syria. He said an earlier UN proposal for 250 observers was insufficient. Ban also said that the freedom of access of the advance monitoring team was imperfect. It was allowed to visit Deraa but not the battle-scarred town of Homs”.